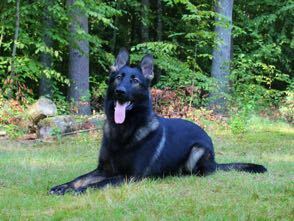 We train Belgian Malinois and German Shepherd dogs for home protection in three different levels: Protector, Guardian and Guardian Plus. All of these dogs are given the same thorough off-leash obedience training, so your personal protection dog can easily stay by your side all day long.The difference between the training levels is the protection exercises that are involved. You can see a visualization of included exercises at our training levels comparison chart, or continue reading for an overview. We will often train and list a dog for a lower training level than he or she is capable of completing. We do this in the interest of offering more variety in our selection. If you are considering one of our protection dogs for sale but would prefer him/her to have a higher level of training, please contact us to see if the dog you have selected is eligible or currently undergoing further training. 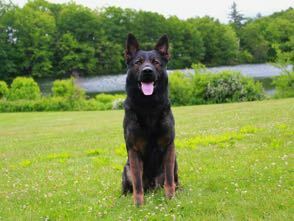 Our personal protection dogs trained at this level represent a tremendous value: total off-leash obedience and great on-leash protection. On your command, these dogs are capable of turning on aggressively toward a threat, turning off, biting and releasing. You can call your dog to protect you from another room. Your dog is trained in defending against weapons and fighting a threat with his/her entire body. Your family can make a safe retreat while your dog remains engaged with the threat. Your dog can be left in charge of guarding your car or home. Your dog can be sent at an attacker over a great distance and be recalled at any moment. The advantage of the Guardian Plus training level is that it includes our most advanced exercises. Multiple Attackers: In a situation with 2 or more attackers, you can direct your dog to the most prominent threat. Stealth Mode: There are times when your gut tells you that a situation is unsafe even when there are no visible causes for concern. In this situation, you can switch your protection dog into a state of silent, heightened preparedness. Without showing aggression overtly, your dog will be ready for anything. Guard Specific Area: Even without the physical boundaries of a car or a room, you can direct your protection dog to watch over a specific object or area (such as the bottom of the stairs). Depending on the natural ability of the dog, you can also request that tricks be added to any of our training levels. Examples of tricks you can request are: Spin, Roll Over, Beg, Bow, Stand, Walk Backwards, Weave Between Legs and Fetch a Beer.